It's official ... It is Spring, REALLY! It really is officially Spring! Seems like we have all been eagerly awaiting the official proclamation but did we really think it would arrive on the coat tails of yet another snow storm for the northeast? Hopefully, you will start seeing a warming trend in the near future! I have to admit I have been in warm weather for the last two weeks and just as we headed north to Atlanta, we got caught in hopefully one last cold snap! It should be warm in San Diego in April, though! Have you registered for CEC? Got your airline ticket yet? For a quick reference to the CASE Activities at CEC, click here. We are so excited about the CASE activities at CEC! The CASE Executive Committee will meet there on Tuesday, April 7 and the CASE joint membership and board of directors will meet on Wednesday, April 8 starting with a full breakfast sponsored by SCHOLASTIC, Inc. and going until about 4:00 that day. During the meeting we will have a wonderful afternoon break sponsored by CATHY SARTAIN INDUSTRIES. We will also be honoring both units and individuals during our Awards time, sponsored by MASTER TEACHER. We want to have all the CASE members who are attending the Convention to come be a part of this informative and purposeful meeting! 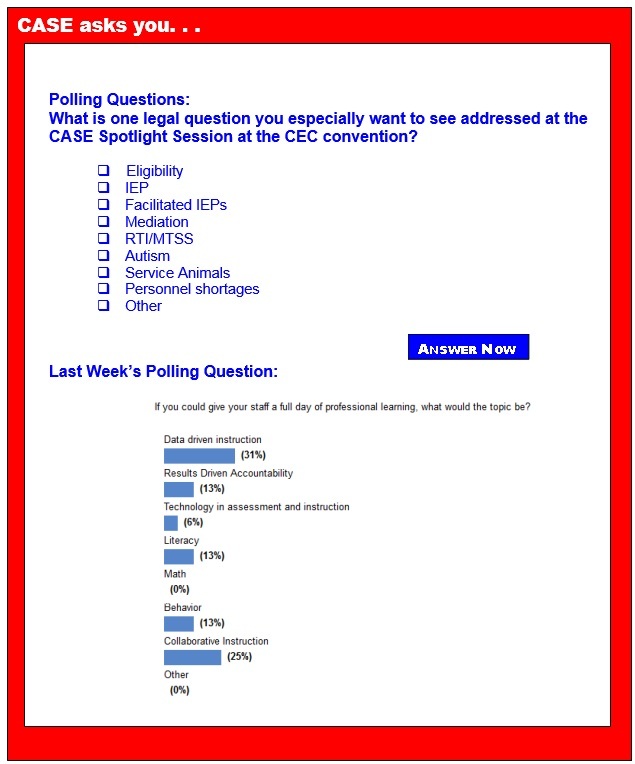 This week's poll is asking you what legal question would you like to see addressed at the CASE Spotlight session at the CEC Convention. Once again Julie Weatherly, Esq. will be doing 90 Tips in 120 Minutes! This year our very popular spotlight session will be sponsored by SCHOLASTIC, Inc.! We want to give them a very big thank you for sponsoring both the member breakfast and the Spotlight session! They are great supporters of CASE! We also want to give an especially big thank you to Star Autism, VizZle, and C8Sciences for their sponsorship of CASE NIGHT. Have you gotten your tickets, yet? As of Friday, we only had 25 left so if you are wanting to go, better go to the CASE website and get your ticket now! For a quick reference to the CASE Activities, download this "cheat sheet." Have you ever used the CEC Legislative Action Center? The article below from the CEC Children Action Network is requesting ACTION of all of our members on writing three (3) letters to various Congressmen. It is very easy to write these letters by going to the CEC Legislative Action Center. Once you go to the link, you will see a section named "TAKE ACTION." These links will then take you to the letters to ask your members of Congress to sign on to the Dear Colleague letters being circulated in the Senate and House. These letters are already composed in a word document format you can then edit. We always suggest you add at the very least that you are a member of the Council of Administrators of Special Education which is a division of CEC. You might also want to add if you have a state subdivision. If the Senator or Representative you are writing is one of your own, then make mention of any situation that might tie you to him/her. The hard facts have already been written for you so it will take you just a few minutes to "personalize" and send off these letters. Please take a few minutes to read the article and to go to the LAC and make your voice and our collective voice heard! Last Week's Poll was on asked "If you could give your staff a full day of professional learning, what would the topic be?" The first place answer was actually the first answer, Data driven instruction coming in with 35 percent of those answering the poll choosing this as the number one topic they wish they could have a full professional learning day! Collaborative Instruction came in second with 24 percent of those answering the poll. There was a three way tie at 12 percent for Results Driven Accountability, Literacy, and Behavior. Last place at just 6% was Technology in assessment and instruction. CAN Action Alert — Send to Networks NOW! Message: Ask for funding for the Javits program be continued in the FY 2016 Labor HHS, and Education Appropriations bill at the highest possible level given the overall budget limitations. Message: Ask for the House Appropriations Subcommittee on Labor, Health, and Human Services to support significant funding for IDEA in FY16 to put the nation on the path to full federal funding within ten years. Message: Ask the House Appropriations Subcommittee on Labor, Health, and Human Services, and Education to support an investment of $70.1 million, the FY 2010 enacted level, for NCSER in fiscal year 2016. Go to CEC's Legislative Action Center and send all three letters today to your members of Congress! iPads are the answer, what was the question? The U.S. Department of Education today announced free access to video-on-demand children's television programming for thousands of students who are blind, visually impaired, deaf or hard of hearing. A number of children's and family TV episodes may now be viewed online featuring closed captioning and descriptions through the Education Department's Accessible Television Portal project. Some of the featured and most popular shows include: "Ocean Mysteries," "Magic School Bus," and "Bill Nye the Science Guy." The Institute of Education Sciences invited State educational agencies to apply for grants to assist them in using data in statewide, longitudinal data systems to inform their efforts to improve education in critical areas. the Institute of Education Sciences announced a special competition called The Evaluation of State Education Programs and Policies (State Evaluation) Grant program which supports the evaluation of fully-developed programs and policies implemented by State educational agencies to determine whether they provide a valuable impact on student education outcomes. These evaluations are designed to measure the overall impact of the programs/policies and the impact across a variety of conditions. When a middle school cheerleader with Down syndrome was being bullied, the team she cheered for came to her rescue. During a basketball game, students in the stands taunted Desiree Andrews, according to KTLA, a local news station in Wisconsin. The team's players then walked off the court and confronted the bullies about their actions. "We were mad. We didn't like that," Miles Rodriguez, one of the players who walked off the court, said, according to Fox News. An increasing number of students with disabilities are graduating high school, federal officials say, though they still receive diplomas at far lower rates than other students. The graduation rate for students with disabilities reached nearly 62 percent during the 2012-2013 school year, representing a rise of almost 3 percent compared to two years earlier. The figures released Monday from the U.S. Department of Education’s National Center for Education Statistics come a month after federal officials said the nation’s overall high school graduation rate reached a record-high of 81 percent in 2012-2013. For as long as ADHD has been recognized by the medical community, the rate at which it occurs in children has been disputed, ranging from as low as 3 percent to as high as 14 percent. The conflicting numbers confuse parents, doctors, and patients, who struggle to determine if the condition is over-diagnosed — and over-medicated — or under-diagnosed. A new study published in Pediatrics claims to have identified a benchmark estimate for the worldwide rate of ADHD in children. The study's authors analyzed the data from 175 studies from around the world, conducted over 36 years, to reach their overall estimate: approximately 7.2 percent of children worldwide have ADHD. A famous proverb tells us, "Give a man a fish and you feed him for a day. Teach a man to fish and you feed him for a lifetime." When applied to teaching — and, more appropriately, to special education — it also begs a question. Who decides if the best approach is to give a fish or teach fishing lessons when teaching a student with learning disabilities? The teacher must always be negotiating and evaluating. Districts in the midst of Common Core implementation are increasingly turning to instructional coaches to help teachers master the new skills needed. Administrators say these coaches, whose positions were cut in many districts during the recession, are now a valuable investment for time-strapped principals working to ensure schools are transitioning smoothly to the new standards. A new cognition tool is intended to help higher-functioning students with autism maximize their learning potential when they demonstrate inflexible thinking and difficulty identifying relevant information. Skills Advanced Cognition, from SKILLS, is a Web-based system is a specialized tool for the design and implementation of advanced teaching plans to help higher-functioning individuals diagnosed with autism reach their fullest potential. How can I prepare my child for the upcoming IEP meeting? Parents often ask me how to prepare for IEP meetings. One way is to send your child's case manager a list of questions you need answered. Let the case manager know that you need the answers to effectively contribute to the development an appropriate IEP — one likely to produce important progress in important areas. When writing the questions, make sure they're important, specific and answerable. Here are sample questions from the parents of Lucas Enigma, a mythical child with reading and other learning disabilities. Could your child's reading struggles be dyslexia? It happens every year: A parent is called by her young child's teacher. "Your daughter is not keeping up in class and her reading is behind that of her peers. She takes much longer to do her work, and her writing is sloppy. You need to work with her more at home." The parent feels perplexed and anxious because she has already been working with her daughter for hours each night. She tells her she must apply herself more and stop goofing off. Later on, she wonders if that was the right thing to say. Those of us who have spent over 10 years in the field know firsthand that the face of the classroom has changed considerably. Long gone are the days when simple, whole class behavior incentive plans kept every student on an even keel. Even experienced teachers may not be sufficiently prepared to address the social and emotional needs of today's students, especially those struggling with anxiety. Anxiety disorders are alarmingly prevalent among U.S. children and adolescents, with 31.9 percent of teens having had an anxiety disorder during their school years. Add to that other increasingly prevalent childhood conditions, including ADHD and autism, and teachers are facing new and overwhelming challenges. New research shows there is a strong correlation between water fluoridation and the prevalence of attention deficit hyperactivity disorder, or ADHD, in the United States. It’s the first time that scientists have systematically studied the relationship between the behavioral disorder and fluoridation, the process wherein fluoride is added to water to prevent cavities. In rural southern Mississippi, finding enough qualified speech-language professionals to fully serve a growing population of students with speech and language delays can be problematic. Stone County School District in Wiggins, Miss., employs three speech-language professionals: two fully certified, Master's level speech-language professionals who are responsible for higher-level activities such as full evaluations, reporting and leading IEP meetings, and one speech-language professional with a Bachelor's degree and who can perform a more limited set of therapy activities as regulated by law. Despite a growing number of students refusing to take Common Core-aligned exams this spring, a record number of tests are being completed, according to data from one of the two main testing consortia. The Partnership for Assessment of Readiness for College and Careers consortium — which began testing in eight states and the District of Columbia last month — said more than 2 million tests had been completed. Louisiana, Massachusetts and Rhode Island will also be deploying PARCC exams soon. In total, PARCC expects 5 million students will take its exam this year, the consortium said.